At the intersection of FEE-FREE and FLEXIBLE, these unique gift cards are redeemable at a variety of participating stores and restaurants with NO activation FEE. Learn more about the benefits of multi-store gift cards. Wish you could buy a gift card redeemable at more than one store or restaurant without paying an activation fee? You’re in luck! Most of the gift cards below are usable at a variety of participating stores and you don’t have to pay extra! The gift cards listed below are redeemable at any of the stores and restaurants shown on the card. There is no activation fee so the dollar amount you spend on the card is the same amount the recipient will enjoy when the card is redeemed. In some cases, these gift cards are only redeemable in stores (not online), so be sure to check the gift card terms and conditions before making your selection. Happy Teen Gift Cards are redeemable in-store at the following U.S. locations: Regal Cinemas, Sephora, Dave & Buster’s, Nike, Barnes & Noble, Jamba Juice and American Eagle. 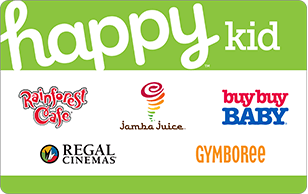 Happy Kid gift cards redeemable in-store at these U.S. locations: Bymboree, Jamba Juice, Rainforest Cafe, Regal Cinemas, and Buy Buy Baby. 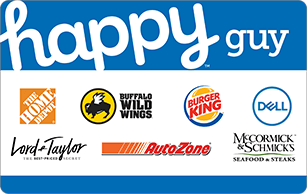 Happy Guy gift cards are redeemable in-store at these U.S. locations: The Home Depot, Buffalo Wild Wings, Burger King, Dell, McCormick & Schmick’s, Lord & Taylor and Autozone. 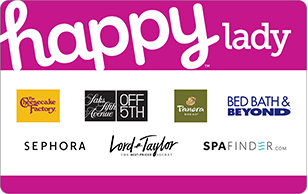 Happy Bride Gift Cards are redeemable in-store at these U.S. locations: Bed Bath & Beyond, David’s Bridal, Ulta Beauty, JCPenney, SpaFinder.com. 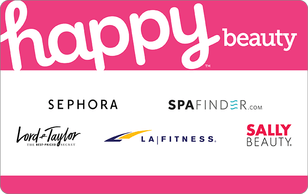 Happy Beauty Gift Cards are redeemable in-store at these U.S. locations: Sephora, SpaFinder.com, Lord & Taylor, LA Fitness, Sally Beauty. Happy Student gift cards are redeemable in-store at the following U.S. locations: Dell, Bed Bath & Beyond, Burger King, American Eagle, JCPenney and Aerie. 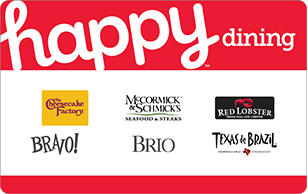 Happy Dining gift cards are redeemable in-store at these U.S. locations: The Cheesecake Factory, McCormick & Schmick’s, Red Lobster, Bravo!, Texas de Brazil and Brio. 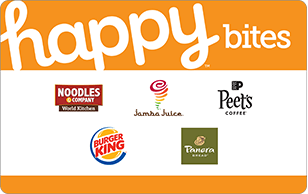 Happy Bites gift cards are redeemable in-store at these U.S. locations: Panera Bread, Jamba Juice, Noodles & Company, Peet’s Coffee and Burger King. 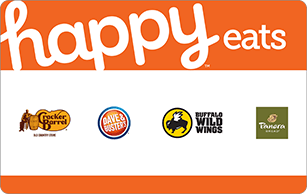 Happy Eats gift cards are redeemable in-store at the following U.S. locations: Cracker Barrel, Buffalo Wild Wings, Panera Bread and David & Buster’s. 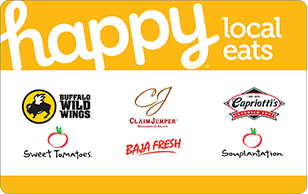 Happy Local Eats gift card is redeemable in-store at these U.S. locations: Buffalo Wild Wings, Claim Jumper, Sweet Tomatoes, Capriotti’s Sandwich Shops, Baja Fresh and Souplantation. Dining Out gift cards are redeemable in-store at the following U.S. locations: Cold Stone Creamery, Jamba Juice, Panera Bread, Buffalo Wild Wings, Red Lobster and The Cheesecake Factory. 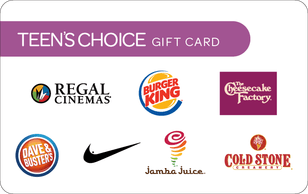 Teen’s Choice gift cards are redeemable in-store at these U.S. locations: Regal Cinemas, Burger King, Nike, Dave & Busters, Cold Stone Creamery, Jamba Juice and The Cheesecake Factory. 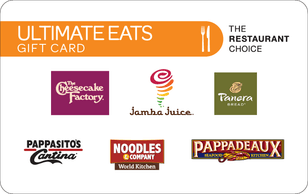 Featuring regional brands in the West, the Ultimate Eats Gift Card West is redeemable in-store at these U.S. Locations: Jamba Juice, The Cheesecake Factory, Sweet Tomatoes, Baja Fresh, Souplantation and Cappriotti’s Sandwich Shop. 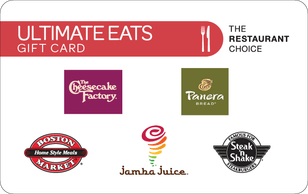 Featuring regional brands in the Midwest, the Ultimate Eats Gift Card Midwest is redeemable in-store at the following U.S. locations: Boston Market, Jamba Juice, Panera Bread, Steak ‘n Shake and The Cheesecake Factory. 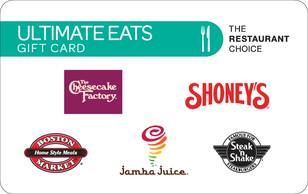 Featuring regional brands in the Southeast, the Ultimate Eats Gift Card Southeast is redeemable in-store at the following U.S. locations: Boston Market, Jamba Juice, Shoney’s, Steak ‘n Shake and The Cheesecake Factory. 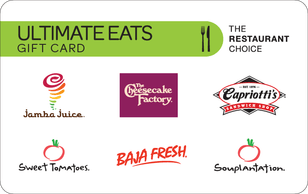 Featuring regional brands in the Southwest, the Ultimate Eats Gift Card Southwest is redeemable in-store at the following U.S. locations: Jamba Juice, Panera Bread, The Cheesecake Factory, Pappasito’s, Pappadeaux and Noodles & Co.
Spafinder gift cards are redeemable at thousands of salons and spas across the United States. 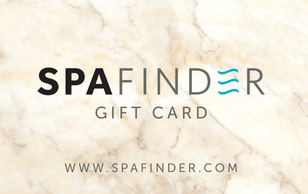 From manicures and pedicures to massages and more, Spafinder gift cards make it easier than ever to “gift” a local spa experience. The perfect gift card for the golfer on your list. The Go Play Golf gift card is redeemable at thousands of public golf courses and it can be used to pay for greens fees, golf lessons, golf equipment and more. Fandango gift cards can be redeemed online for tickets usable at nearly every major theater across the country. Fandango.com even has an app, making it easier than ever to buy movie tickets anywhere and everywhere you want. No need to worry what theater is near your friend because MovieTickets.com gift cards are usable at hundreds of neighborhood movie theaters. 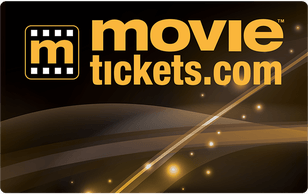 Similar to Fandango, you must buy your gift cards directly from MovieTickets.com. 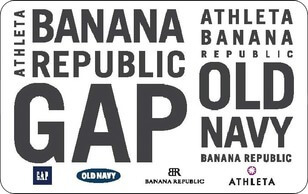 Gap gift cards may be redeemed online and in stores at Gap, Old Navy, Banana Republic and Athleta locations within the United States. Give the gift of style without limiting the recipient to any one brand. Not sure if you should get a Chili’s, On The Border or Maggiano’s gift card? No worries. 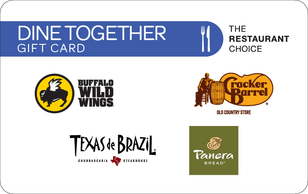 Brinker gift cards are redeemable at all of the U.S. restaurants within their brand family. So eat up! 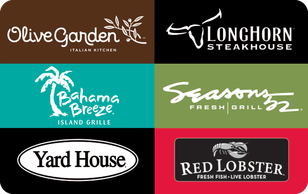 Darden Restaurants gift cards are usable at Olive Garden, LongHorn Steakhouse, Bahama Breeze, Seasons 52, Yard House and Red Lobster restaurants throughout the United States. That’s 6 great menus! Another great dining gift card that is usable at multiple restaurants. Landry’s gift cards are usable at Claim Jumper, Morton’s Steakhouse, Bubba Gump and at least 15 other locations in the United States. 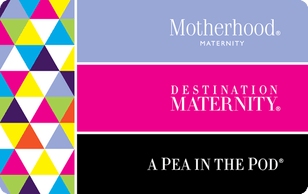 Destination Maternity gift cards are redeemable at Motherhood Maternity and Pea in a Pod stores throughout the United States. If your friend is expecting, this is the perfect gift for new parents. 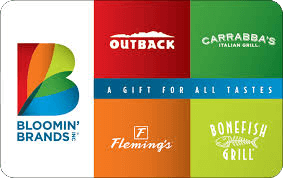 Bloomin’ Brands gift cards are usable at Outback Steakhouse, Fleming’s, Bonefish Grill and other restaurants in the Bloomin’ Brands chain. With one dining gift card you get several great restaurants to choose from. NOTE: It’s important to know that gift cards within a “brand family” are generally usable at any of the company’s merchants, whether the brand logo is shown on the card or not. For example, if you have an Old Navy gift card, you can use that card at Banana Republic, even though the classic BR Logo may not be shown on the card. If you’re not sure where a gift card can be used, check the website or call the telephone number listed on the back of the card. We can’t talk about multi-store and brand-family gift cards without acknowledging the most flexible gift cards available. Both Visa® and Mastercard® Gift Cards are called “open-loop gift cards” because they are usable wherever those debit cards are accepted which includes online, in stores, over the phone and so forth. The cost of this flexibility is, however, that you have to pay an initial fee to activate the cards. Here’s more information on the differences between bank-issued and store gift cards. Usable wherever Visa debit cards are accepted, this Visa gift card can be personalized with your own image or designed with an image from one of our artists. Mastercard are convenient to send and to spend! For just a few dollars more than closed loop cards, you can use this gift card at nearly all of your favorite stores and restaurants. There are several benefits to giving someone a gift card that can be used at more than one store or restaurant. Whether you opt to buy a true multi-store gift card (such as the Dining Out Card list above) or you select a brand-family gift card such as Gap Options, the more choices the recipient has, the higher the likelihood the gift card will get used. Here are three benefits to giving someone a gift card usable at a variety of stores and restaurants. 1. Increased Customer Choices. For 11 years in a row, gift cards have been voted the most-requested gift of the holiday season. Various gift card statistics also show that people prefer to receive gift cards over traditional presents so they have the freedom to pick out their own presents. Multi-store gift cards, brand-family gift cards and bank-issued gift cards all increase the number of ways consumers can buy the gifts they most want. 2. Protection Against Store Closings. Since multi-store gift cards are usable at a variety of stores and restaurants, consumers can confidently purchase these gift cards knowing that the card will maintain it’s value even if one of the participating merchants goes out of business or files for bankruptcy protection. 3. Fee Free. Consumers have historically had two choices–buy closed-loop gift cards that are only redeemable or the issuing store or restaurant locations or pay extra for a gift card that is usable in more than one place of business. Multi-store gift cards offer the best of both worlds–increased flexibility and usability and more than one merchant without paying an activation fee. Since each multi-store card, also referred to as a category card, comes with it owns redemption instructions, I strongly suggest you read the terms and conditions associated with each card. And also, check back often to see what cards we have added. As I find gift cards that include the benefits listed above–flexibility, less dependence on a single brand and no activation fees, I will be sure to add the card here as well. So what other questions do you have about this new hybrid style of gift card? Leave a comment below and I will be sure to answer your question as soon as I get a chance. Have Questions about Gift Cards Redeemable at Many Stores? Add a comment below.